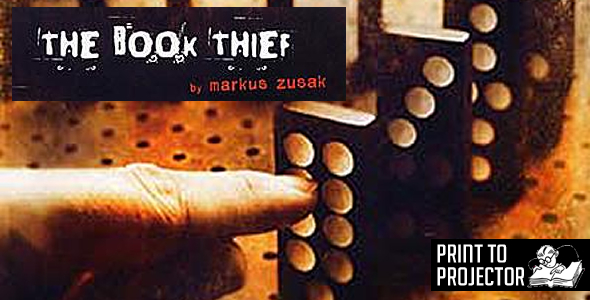 Markus Zusak’s The Book Thief is a masterpiece. So I’m both excited and terrified by the prospect that a movie interpretation of the book will be in theatres November 15, 2013. I always get this way about movie adaptations. I don’t know whether to be scared or excited or both. I usually end up sticking with both. I would love to have a movie adaptation to watch—a fixed face to envision on characters I love, a score to hum, a whole world I can see instead of just imagine. But I also get all wrapped up in thinking: it could be terrible. It could say that it’s going to be an adaptation of a book I love but really just be a mess with Brad Pitt’s name on it (I’m looking at you, World War Z) and then no one else will get to do an actual good adaptation of it. Yes, I do look like your Uncle Milton*. Anyway. My varied and warring feelings about the movie would be much less intense if I didn’t honestly believe that The Book Thief is genuinely a masterwork. If the movie is anything less than amazing I will be both crushed and infuriated. But no matter how the movie comes out (brilliant, horrible, or just different) you should read The Book Thief. It’s important. Set in Nazi Germany, Zusak’s The Book Thief follows the life of Liesel Meminger—a young German girl sent to live with Hans and Rosa Hubermann when her father becomes a political prisoner. The book is narrated by a kindly, tired, darkly funny, overworked Death, who crosses paths with Liesel again and again as she grows up in the dusty town of Molching. As the war gears up, Liesel befriends Rudy Steiner, the boy down the street, and Max Vandenburg, the Jewish fist-fighter hidden in the basement. 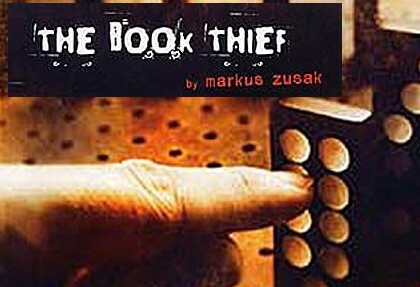 Liesel learns to read, steals apples, hides from bombs, and becomes the book thief. If you’re anything like me you will come to love almost all of the characters and it will pain you when terrible things happen to them (as is inevitable, even in fictional Nazi Germany). Zusak works utter magic with his characters. The descriptions of these characters alternate between poetic and blunt. The characters themselves are grounded, imperfect, complex, gray, idiosyncratic, loving, hateful, righteous, ridiculous, and they feel absolutely true. It is difficult not to love nearly all of them. Including Death. Our narrator, Death, is soft, tired, worn down and very, very lost in the slog and onslaught of the war. I’m going to avoid giving away any more of the plot because it’s better to discover it as Death delivers it to you. But yes, this book is set in Nazi Germany, and yes, WWII happens, and Death does not simply spend all of his time narrating the sunny spots in young Liesel’s life. Zusak’s writing brings perfectly rendered trauma to characters you can’t help but love and he will make you cry. Bring tissues. This one’s a life ruiner. I understand that this is not subject material for everyone, and it’s not something to pick up for a Light Beach Read, and that some people may never want to pick it up, knowing that they’ll cry or be depressed. And that’s fine. But it is important. The Book Thief is stunning and powerful and it is art that will almost do violence to you with how much it matters. Because while this book is set during a regime built on hate, the book itself is about hope, survival, and the reframing of loss and hatred and vitriol into gifts, into kindness—into tender tremulous, relentless connections—into communication and love. You should read it before you see it because The Book Thief is beautiful for so much more than its plot. It’s often beautiful for the things that make it a book. The prose Zusak uses, the tone and color of Death’s narration, Zusak’s arrangement of text on the page, and Zusak’s books-within-the-book would be difficult to translate to film. And they are so integral to the power of The Book Thief. I refuse to spoil things for you, so that’s all for now, but trust me, the books-within-the-book are better when you can feel the pages yourself, and when you can examine the faint yet insistent impressions of the words that had to be painted over to make room for the new stories. The Book Thief is also, in many ways, a love letter to books and writing and words on pages. Throughout this book, Zusak treats stories, and books, specifically, as necessities for survival. The Book Thief is a story that matters and Zusak tells it beautifully. And it is a book for a reason. Then read it again and again and again and get quotes tattooed on your skin. *10 Things I Hate About You. You’re welcome.